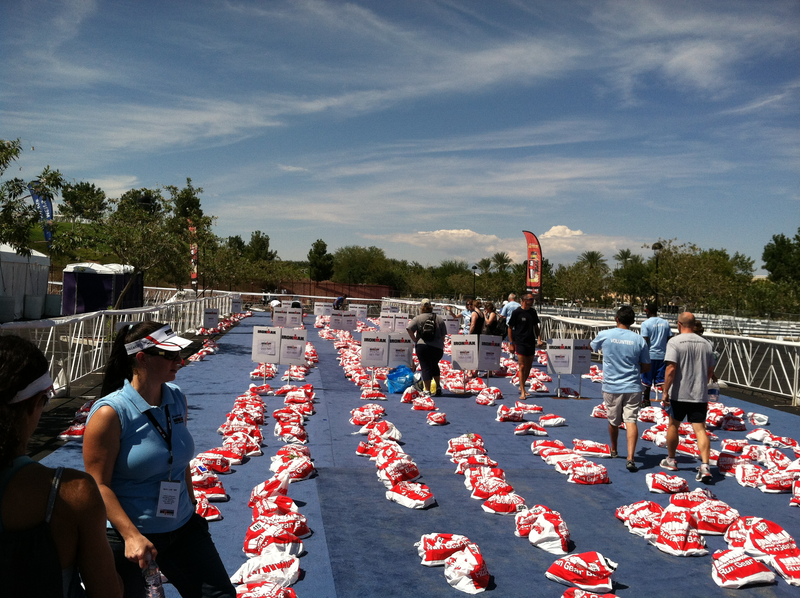 This is the run bag check-in the day before the Ironman 70.3 World Championship in Henderson, NV. The temperature hit 108F — I don’t know if that’s an Ironman expo record, but it was definitely a harbinger of things to come. Living in the SF Bay Area as I do, I am not really accustomed to that kind of heat, especially after the pretty mild summer we had. On the other hand, I’ve done ok in some pretty hot races — Kona ’09, pretty much every Honu 70.3, IM Germany ’06 — “well” as in “I survived and paced myself conservatively for the conditions.” So at least I have an approach to challenging conditions that is known to work for me. So why did I find myself charging up the hills in the first hour of the bike pushing over 300 watts like it was a Wednesday evening chase groups workout? Because apparently I’m not really a learning organism. In hindsight, the entire lead-up to this race was all wrong — I didn’t treat it like an A race, because it wasn’t. It was a race I was fortunate enough to get a rolldown slot for at the Hawaii 70.3 race, but my big goal this fall was and is Ironman Arizona. So this was supposed to be a good workout, a fun event that I hadn’t planned on doing, and one that I wasn’t coming in for tapered and with high expectations for. And it started off fine: the swim was a much better experience than normal in IM events, because it used waves 5 minutes apart rather than one big mass start. So that meant I wasn’t getting the crap beaten out of me from the outset. The 82-degree bathwater of a lake, though, was not the most pleasant swimming experience — I’m sure I lost 4 or 5 lbs during it, as well as a lot of minutes compared to a wetsuit-legal swim. My left calf started cramping in the last couple hundred meters, which wasn’t a good omen, but I got my 40+ minute time and went on my way. You’ve got a lot of riding in the first hour well above 200 watts, spiking above 300 for some short efforts on climbs, but even with a CP 1 min of 292W. Later on you see declining power but rising heart rate, an effect of both the early spikes in power and the increasing heat of the day — and most of all, of course, because of my increasing level of dehydration and electrolyte loss. I was on a decent pace for most of the ride, on target to finish between 2:40 and 2:45, but there were signs of trouble. Number one, I was getting twinges of crampiness, which I managed to hold at bay by taking electrolyte caplets, but far more often than planned. I was also going through fluids very quickly but had no urge whatsoever to pee. What’s more, the aid stations seemed few and far between — usually you’re at them before you’ve emptied your bottles. However, other than that, I was feeling ok and still had more than enough power to get up the relentless series of rolling hills in the Lake Mead recreation area. It wasn’t until past mile 40 that things began to unravel pretty rapidly: as the course went downhill, so did my race. 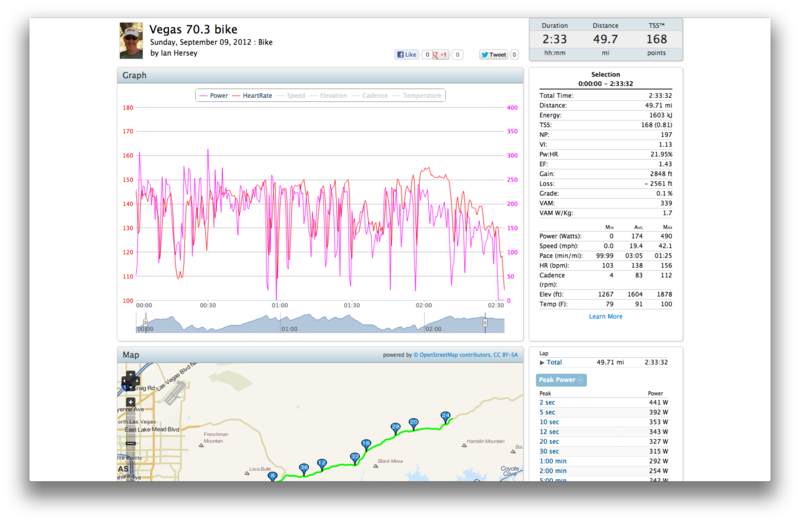 I was able to coast down Lake Mead Parkway, but once it flattened out I started cramping when I turned the pedals. More electrolyte caps, more fluids, and I took advantage of more downhill on the early part of Warm Springs Rd. But on the ensuing flat part of the road, my left quad completely seized up in a very painful series of cramps, followed quickly by the right quad. I was able to make slow forward progress by extending my left pedal, pushing down slightly, then pulling up slightly again and repeating. Almost like a push bike. That got me to the aid station at 50 miles, so close and yet so far. I couldn’t control the cramping, but I did manage to unclip and get off the bike before another painful series of spasms hit me. The aid station volunteers were great — they brought me bananas, water, sports drink, energy bars — anything they thought would help. I set there on the median strip in the blazing 100F sun and felt cold enough that I got goosebumps. That’s a pretty clear sign of severe dehydration. I must have sat there for 20 minutes while the cramping came and went, and then I tried remounting my bike, determined as I was to finish the damn race. As soon as my right leg got over the top tube, the quad cramped severely again. So back I went to the median strip, this time under the shade of a tent. I was soon joined by a 50+ woman named Linda, who was also cramping badly. I gave her a few of my remaining precious electrolyte caps, as it was becoming clear to me that I might not make it to the run. She needed them now more than I would later. Various parts of my body continued to cramp — oddly my hands, which became twisted like pretzels. A race official with a truck came up to us and told us he would take us to T2 if we decided to drop out. I wasn’t ready to do that, but on the other hand I wasn’t feeling well enough to remount my bike. Finally, after more than an hour at aid station #4, I (and Linda) pulled the plug. I wasn’t happy about it — I don’t like to quit, as I’ve come to feel that once you allow yourself to quit, it becomes easier and easier to quit the next time. But once I got to T2 and saw all of the folks suffering in the hottest part of the day on that run, I honestly couldn’t see myself being among them. The pros may treat the half Ironman as a long Olympic distance race in terms of how they pace themselves, but age groupers — even those good enough to qualify for the championship — need to treat the distance with more caution. When it’s as hot as Hades Henderson, pace yourself in a 70.3 as though it’s a full Ironman. Also, if I had watched my heart rate more closely instead of just my power, I would have seen that my body was putting out way more effort than it would have normally done at that power output — a sign that you should adjust your numbers downward to account for the conditions. Great write up. A painful way to learn but one that will stick, I’m sure. I learned about marathon pacing in a similar fashion :-). My use of HR as a guide to effort on the bike served my very well in the conditions so I actually enjoyed (in a sick and twisted way) my opportunity to run 3×2.2 mile repeats in 100 degrees. Now point your nose at Arizona and go git ’em!